Drake Britton is a 21-year old pitching prospect, currently ranked as the Red Sox’ fourth best prospect and number 97 overall in Baseball America’s annual ranking. As one of the youngest prospects in Boston’s system, he is considered to be a very high-ceiling player. At 6-2, 200 he already has a good frame and is still growing. Hailing from Magnolia, TX, Britton was drafted in 2007 as the Sox’ 23rd round pick out of Tomball HS. He was committed to Texas A&M, and slipped way down due to signability concerns (Boston eventually got him with a $700k bonus). It looks like he turned out to be a real steal after all. 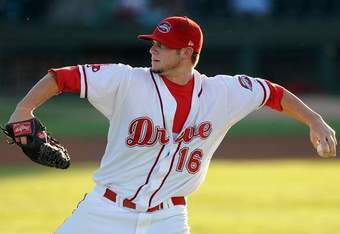 After being derailed for most of 2009 by Tommy John surgery in October 2008, Drake worked extremely hard during his time away, added velocity and turned in an All-Star performance for the Greenville Drive (A) last season. He was selected as the Red Sox Breakout Player of the Year. He changed his body so much that then-Farm Director Mike Hazen called him “a different physical animal” in April 2010 than he was before the injury. Just how good was Britton last year, in his first professional season since having surgery? In 21 starts, he maintained a 2.97 ERA over 75.2 innings, allowing only 69 hits while striking out 78 victims (9.3 K/9). Perhaps even more impressive for a young southpaw was his control, as Drake gave out only 23 free passes all year (2.7 BB/9) for an impressive K:BB ratio of 3.39. Britton had no problem keeping the ball in the park, allowing just 5 dingers last year. That being said, it was just one season. I still consider Anthony Ranaudo our top pitching prospect until Britton shows that he can keep this up over more innings and at a higher level. Britton throws from the three-quarters arm slot, and features a mid-90s fastball that has been clocked as high as 97 mph and a hard, biting mid 70s curve. His two-seamer has good sinking action, and is a tough offering as long as he keeps it down in the zone. Drake’s 12-6 curve is considered a potential plus to plus-plus pitch, and he’s been developing an 80-mph changeup. Drake trusts his stuff and is aggressive and throws strikes, so if he improves that third pitch and adds, say, a cutter, he could have a really formidable, Major League-level repertoire. He has been compared with the White Sox’ John Danks, who also throws hard and features a sharp curve. I think if he grows into that kind of a player, we would all be very happy with that. Expect Britton to start the year at High-A Salem, with a possible jump to Portland midseason, should he merit the move. However, don’t expect them to rush him; the goal with him should be simply to build up endurance and consistency this year, and maybe work on that third pitch a little bit. We won’t know until he faces stiffer competition just how good he will be, but there’s a lot to like. He is still working on consistency, as can be seen by his 7 wild pitches last year. The Red Sox kept Britton on a tight leash last season, but they plan to bump up Britton’s innings total to about 120 this year, which would put ideally him on track to be ready to join Boston’s rotation sometime in 2013. The Red Sox don’t have much room in the rotation going forward, but Tim Wakefield is expected to retire, and Daisuke Matsuzaka’s contract will be up after 2012. It looks like Britton, Ranaudo and Stolmy Pimentel could be vying for those spots, though the Sox do have other, more developed options in Junichi Tazawa and Felix Doubront. Don’t expect all of these guys to stick, but the take home point is that the Red Sox have stockpiled some pretty good depth for the rotation behind mainstays Jon Lester, Josh Beckett and John Lackey.